Haven't been to the pub since it's makeover but was very impressed. We just popped in for a drink on a hot day & all outdoor tables were full and the menu looks interesting too. Will definitely drop by again soon ! Popped in last minute for Sunday lunch, very accommodating, good food and atmosphere. It was our first visit as a family and will be going back. Great lunch menu - lovely setting, terrace area with outside eating on a lovely sunny day. Very helpful and friendly service. GOOD! I went to the Golden Ball for lunch, it was packed. Luckily we had booked. I had salad nicoise and the person with me had sole. My friend's potatoes were not fully cooked. I asked for the tuna to be seared for the salad nicoise and they said fine. It turned up over cooked. They advertised that the nicoise had boiled eggs as it should do and it came with a poached egg. The salad was OK but was not really a salad nicoise. During lunch there was an almighty crash and one of the waitresses had dropped a dish of tartare sauce which covered my back and chair. We were given a cup of coffee and a portion of chips for free to make up for it! The staff are VERY friendly and otherwise it is a pleasant place for lunch, although it is not a good idea to sit inside near the loud speakers they have for the canned music. I heard the golden ball had changed hands so thought I would pop in with my husband on the off chance the other day - and so glad we did! What a little gem we have now found. The welcome and staff were absolutely lovely and nothing seemed too much trouble. The food was just amazing, I had the monkfish scampi - such an unusual take of fish and chips but went down a treat with a nice glass of wine. my husband had a steak, and for a real meat eater he was very impressed! Popped in for lunch was told I was only allowed to sit in certain area. It was a lovely day but patio roped off. Food average, staff rude and unhelpful - will not return. Friendly atmosphere, love the log fire. All the meals have been excellent, if anything large portions!!! Serves a cider we like, but would be nice if it was served cold, only minor issue. consider this to be a very good local pub for us! We will be going back for the 3rd time this weekend with 4 friends. Good Value, service very good, staff lovely, food good. Although very busy on both occasions, tables are not too close to each other, so we can have a good chat without too much noise. Great for family bithdays, anniversarys etc. My family and I go to the golden ball pub all the time as it is one of the only pubs that welcomes children ,we have always enjoyed our vists and been made very welcome .The menu and specials are very impressive and are good vaule for money.It is clear like so many other review sites that less busy pubs write reviews for neighbouring better run establishments to put people off . Called in at Golden Ball today at 2.15 for lunch after attending a funeral and was told kitchen shut, in a rude way. It says on the door 12.00 to 22.00, what happened that is not the way to invite customers, needless to say won't be going back. Since this has returned to the Golden Ball we have been quite often at lunch times and evenings and always have good service and excellent food. Really cannot understand any bad comments - as already suggested probably from a pub not doing so well! Keep up the good work and you will be a pub/restaurant that stays open and will not be turned into a Tesco. I never normally write these reviews but the golden ball was FANTASTIC!!! We visited last night - have been in before but only for drinks this time we were going for a NYE family dinner!! We were all greeted by polite, kind and very friendly staff - this greeting was extended to my 3 year old daughter as well (so many places ignore the children but not here!). Nothing was to much trouble and my daughter had a great time trying on party hats and drawing pictures!!! The food was amazing!!! Every courses perfectly prepared / cooked / presented and clearly made from good quality ingredients - children's meals included - my daughters meal off the children's menu may only have been sausages but they were very good quality sausages!! Over all a fabulous evening we'll certainly be returning!!! Thank you to every one at the golden ball for such a great evening!!! Went for lunch yesterday, have not been for a few months. Food still great, especially the chips, the service very good. Cannot understand the previous review. Tina still has time for her customers despite being very busy. Well done. Regular customer and very disappointed with the service and rudeness of the waitress. Great food and friendly service. There were six of us in our party and we all ordered something diferent. All dishes were superb - hearty portions, fresh salads and vegetables, attractive presentation. Will definitely return. We booked our table in advance for Sunday lunch.On arrival we were greeted with a very warm and friendly welcome and shown to our seats, the staff made sure all 9 of us were seated comfortably. Most of us had the roast dinner and it was all cooked to perfection, the roast potatoes were amazing. Although they were extremely busy and even turning away diners we never felt rushed, all had puddings, followed by more drinks and coffe and then we asked for the bill. Worth every penny. I live in Nottingham and was down visiting family, already planning my next visit to the Golden Ball and will be bringing the family along also. Would highly recommend to everyone. Very friendly and helpful staff, lovely ambience and great food, would thouroughly recommend. I have been a regular at this pub for years,since being taken over it's even better . You can tell other pubs that are no longer busy are writing these reviews. Very sad but true. Food is great and beer and ale is well kept. I would suggest trying the places on this review site as best to find out for yourself . The food portions are not small at all . You will see when you go. The beef burgers are amazing. So, if i post a bad comment it gets removed? Small portion, forgotten side dish, very average. Real shame, I had high hopes. It seems that lots of friends post positive reviews but go along and try the place yourself. You wont return. Been to this pub many a time, always fantastic and even when the hole pub is full , the staff make such an effort with looking after everybody and always inform us of any wait , but when you look around and see the place is full and the lovely garden area full , we know as the food is made fresh that there may well be a wait, but well worth it.went Friday night and had the homemade beef Wellington ,it was to die for.my wife had the swordfish special and toffee apple bread butter pudding.we enjoyed our evening so much we went back on sunday and took a few friends with us and once again the service and food was outstanding, very busy and looking around everyone was enjoying themselves in the sun in the beer garden.hope the weather holds up .also the golden ball new menu is excellent , so much choice for everyone. Well done. Went to the Golden Ball last night. Quite busy but few staff, but they worked like trojans. Was not kept waiting very long for our food. Very attentive,and good humour from Tina our waitress. When we mentioned it was my husbands birthday on Monday, she bought out a surprise 'cake' well a profiterole with a candle, which was really thoughtful. Food was very good and of course the chips. Well done and a nice place to go if you just want a drink. We had a lovely meal at the Golden Ball. The staff were very polite and helpful. There was a relaxed and friendly atmosphere and the food was delicious. I am not a person who really enjoys chips, but after the rave reviews I had heard I had to try them, and they did not dissapoint, deffinately the best chips around. As a vegetarian I was glad to see more of a choice on the menu than at other restaurants. We both said we will return and I already know what I will be ordering from the menu. We chose the Golden Ball to celebrate our parents 70th Wedding Anniversary as the pub had a lovely homely cosy feel and Tina the owner was so helpful. It was certainly a good choice and would like to thank Tina and all the staff for making the day so special, the buffet and decorations were excellent and the day could not have been any better. We have had a couple of lunches there, and went there also for Valentines dinner and again the food was very good. We can reccomend the Golden Ball and will be going back again. Just wanted to say what a fantastic time we had at the New Years Eve Party. The Buffet was excellent and so much of it! Well done to all the staff for making it such a great evening. Cant wait for the next party! The Golden Ball is a wondeful little pub. The service is outstanding, and the food is exquisite-best chips i have ever had! Well done Golden Ball! Keep up the good work- we will be returning very soon. We booked a table at the Golden Ball for our work Christmas meal. The food was delicious and the service was outstanding. The table in which we were seated at was decorated beautifully with christmas themed decorations. We had a splendid evening! Service was excellent, everybody was really welcoming and helpful - the food was also as delightful, and perfectly presented - the decor was splendid. It was our first visit but definately not our last! Well done Golden Ball! My girlfriend and I go to the Golden Ball on a regular basis. We cant understand all the bad reviews we have read on this website. Everytime we visit we always have a good time with excellent food and service. I agree with Sarah when she said the waitress made a fuss of her son for his birthday as whenever we go to the Golden Ball the staff always seem to make great efforts to ensure we and other customers have an enjoyable visit. Keep up the good work! We visited The Golden Ball yesterday and really enjoyed the food (especially the risotto) and the service. The waitress was excellent and made a real fuss of my son as it was his birthday by making his dessert into a mini birthday cake. We'll be back very soon. Popped in for a drink with a friend a couple of weekends back and all was good and well until one of the barstaff noticed that my friend was using his E-NI (electronic nicotine inhalator) inside. His response was to storm over and tell him not to use it inside. When questionned as to why, all he could do was repeat himself and get angry to the point where he seemed spoiling for a fight. None of the customers around us had objected about the use of the e-ni and no-one could understand the staff member's attitude, as there is no reason to restrict the use of e-ni's as there is no combustion and no smoke produced, simply water vapour. Needless to say we will not be returning in a hurry unless clarification on whether the use of these devices are allowed or not. I have been a couple of times to The Golden Ball and found it to be really nice. The service was OK and the food was tasty (particularly since they have now got some new sauces for their steak). Particularly of note are their chips which are the best I have ever had. We recently had a meal there and the service was appalling. We booked in advance on the day, and when we arrived, although we told them we had booked they gave us a limited choice of tables, although many tables had reserved signs on them. When we asked we were told they were reserved - isn't that what we had done by booking ? The meals arrived very late and after ordering more drinks had to go into the bar after 25 mins to remind them that we were still waiting. No one appeared to ask us if we wanted any puddings, and when we went into pay we had to find someone to ask them to take our money. The whole experience was disappointing. Called in 2.15 Thurs 22nd July for quick bite to eat. It was warm, sunny with the odd light shower. The pub was very quiet. We would have liked to sit outside on such a nice day but there were no umbrellas (and no people)on the lovely patio and the back dining area canopies were down, meaning there was no shade from the hot sun, (in fact if we were not regular we would have thought the pub was closed as we drove in),so reluctantly we sat inside. That said the service polite and efficient,though there was no real "welcoming interaction. "the food was simple but good and well priced. I am sure that with attention to the above and a little P.R. and marketing the buzz that the Golden Ball had when it first reopened could be regained - it was an absolute delight then. At The Golden Ball we want our customers to be 100% happy all of the time! We therefore would love to here feedback of any experiences that you have had at The Golden Ball. We need your help in order to improve our services. Please be assured that all feedback is taken seriously and will be promptly acted on and addressed correctly. I would have to agree with the last review. The place started out so well, but with high staff turnover the service has really gone downhill. They have done such a good job in revamping the site, they seem to have forgotten about customer service. The food could do with being a bit more creative aswell. Started out so well. Beer and food still good, however something is wrong; Huge staff turnover, remaining are inexperienced and demoralised and bar service is slow. Recently I have seen no managerial presence and the Golden Ball seems to have lost it welcoming personality as a result. I do hope Tina the owner can fix this quickly as the venue has such great potential. I hope this can be taken as a constructive review. 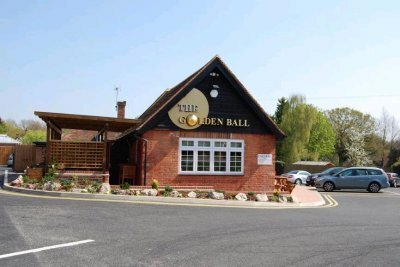 The Golden Ball - Maidenhead posts have all been removed as it appears there have been some libellous posts.